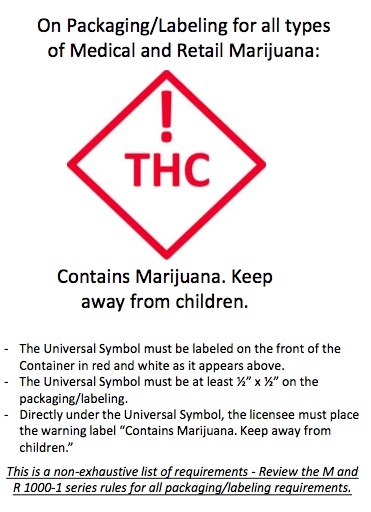 Yesterday, the Colorado Marijuana Enforcement Division issued a bulletin unveiling their universal symbol for all cannabis products. According to the bulletin, the State Licensing Authority adopts the universal symbol for all packaging, labeling and on-product marking for medical and recreational cannabis products, effective immediately. On January 1st, 2019, use of the universal symbol on packaging will be mandatory for all products, with a few exceptions for medical center sales with existing inventory. There is an optional use period that lasts until the end of 2018 where producers and retailers can use the previous universal symbols. 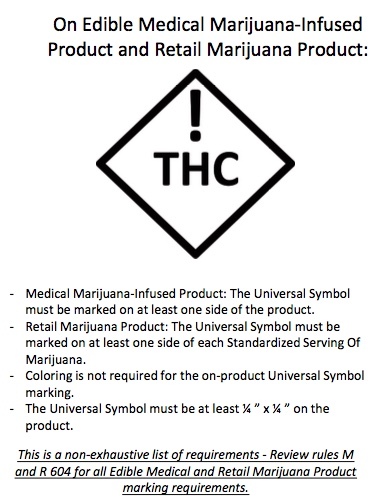 After July 1st, 2019, every product sold in the state of Colorado must have the updated universal symbols, according to the bulletin. On packaging and labeling, the red and white symbol is required whereas on single servings, the symbol must be on one side but doesn’t need to have the colors. Back in 2016, Colorado began using a THC universal symbol, requiring it on infused product servings, essentially as a warning symbol on edibles. 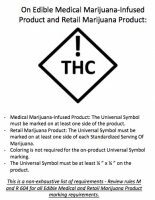 With this newly implemented rule, all products, including packaging for flower and concentrates, must have the symbol on it. Licensees are encouraged to visit the MED’s website for more information.